I had to cancel plans a while back for brunch at a pizza place in Brooklyn that served lattes on tap. That is the closest I’ve gotten to try the innovation attributed to La Colombe: draft lattes. Of course, I could access a version of the beverage in some store somewhere or directly from La Colombe’s website; they’re canning it, now, for distribution and on the go caffeinating and enjoyment. I know it just won’t be the same. Apparently, customers line up at La Colombe locations for the “frothy, barely sweet beverages—no ice—pulled straight from a tap at the bar” even when the temperature outside is sub-freezing. I’ve experienced that kind of word-of-mouth craze before with a New York City institutions: the Halal Guys’ street cart. My best example of the food cart’s success is the night, after 9 hours at my retail job on my feet, in mid-December, I waited in a line that continued to grow after I got into it for 45 minutes, not getting my food until close to midnight. It was worth it; Halal Guys is always worth it. It sounds like La Colombe’s cold, draft lattes are worth it, too. What the heck is a draft latte, anyway? They’re currently selling their draft lattes in a can as well as on tap at their shops and other locations. The science that got them to another delightful coffee innovation apparently involved a long and winding road. One of the first attempts reportedly included a volleyball valve that was drilled into the can to inject the gas necessary for the characteristic microfoam. La Colombe’s invention team teamed up with another innovative company, famous for inventing something we’re all familiar with: the freakin’ bottle cap! They settled on a method that is now implemented on an assembly line. For the can, a valve is inserted into the base; it is called the “Innovolve” and is reportedly the “only FDA-approved valve found suitable to interact with food.” Through that valve, nitrous oxide is infused with the beverage through a tiny pin that prevents exposure to air that would result in taste-destroying oxygenation. That’s the reason nitrous gas is utilized for these draft coffee drinks (see our other article about draft cold brew) because it is more water soluble than carbon dioxide, minimizing oxygenation that breaks down flavor as well as the quality of the beverage. Carbon dioxide also releases carbonic acid as the bubbles release, adding an undesirable sourness to the drink; that works for sweeter sodas and seltzers, as well as some lighter beers that have a naturally citrusy flavor. But for earthy, bitter coffee (and dark beers like Guinness) it is just not what you want. According to technical.ly, La Colombe’s recipe calls for cold pressed espresso, low-fat milk that has been frothed like a traditional latte, and cane sugar (so much for being “naturally sweet). That being said, the advertisement on La Colombe’s website states that the lattes are naturally sweet with no added sugar; it is likely, in that case, that the sweetness comes from the milk. They also advertise it as being made with lactose-free milk; it seems that technical.ly either has incorrect or old information. The drink is then infused with the liquid nitrous oxide injection in what is called a “gasser-shaker,” which shakes the can while the injection occurs for the sake of stability. Then the process involves more innovation in that the cans are blasted with hot water, heating up their internal contents so that they pasteurize; this prolongs their shelf-life to over 180 days. One final bit of innovation comes into play in the form of plastic covering for each can which keeps customers’ lips from having to touch the can itself, minimizing germ exposure as well as that undesirable taste of metal. When Did Draft Lattes Become A Thing? La Colombe introduced their latte on draft, on literal draft, in 2015. At their shops, you no longer had to wait for a barista to pull the espresso, add ice and milk. It could simply be done with the pull of a lever connected to a keg. Out comes cold-pressed espresso mixed with frothy milk, cold without ice and as fast as a beer on tap. One of the main differences as far as texture, or mouthfeel, between a latte and drip coffee with milk added, is that it’s harder to get a uniform diffusion of the milk throughout the coffee with the latter. Because it is more coffee than milk, as well, lattes tend to be naturally creamier, per logic. The draft latte takes this even further by taking out the middle-barista and utilizing the gas-infusing process to sufficiently diffuse and blend the milk and coffee, giving a creamy, pleasing mouth-feel to every swallow with little-to-no deviation. Plus, it’s just that much more convenient. More brands are now following suit with their own versions of Nitro coffee drinks like cold brew and lattes. 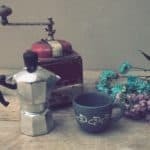 Canning and bottling coffee is a new trend in the United States, starting most prominently with Starbucks who’ve had their sweet, milky bottled “frappuccinos” on shelves for is now over two decades old, having been introduced into grocery stores in 1996. Canned coffee with milk has been around in Japan since the mid-to-late 60s, sold in stores as well as vending machines. They even have methods to warm the ready-to-drink beverages when the weather is colder, though, of course, they’re automatically available in more chilled versions. While the Japanese don’t use the nitrous gas, it has to be noted that La Colombe’s innovation is built upon a history of making coffee, and its desired caffeinated effects, as convenient to access as possible!